I’ve repeatedly argued that faster growth is the only effective way of helping the less fortunate. Class warfare and redistribution, by contrast, are not effective. Such policies are based on the fallacy that the economy is a fixed pie, and proponents of this view fixate on inequality because they mistakenly believe that additional income for the rich means less income for the poor. Today, let’s look at some numbers that prove that a fixation on inequality is misguided. The Census Bureau this week released its annual report on Income and Poverty in the United States. That publication includes data (Table A-2) showing annual inflation-adjusted earnings by income quintile between 1967-2017. To see if my left-leaning friends are right about the rich getting richer at the expense of the poor, I calculated the annual percent change for each quintile. Lo and behold, the data actually show that there’s a very clear pattern showing how all income quintiles tend to rise and fall together. The lesson from this data is clear. If you want policies that help the poor, those also will be policies that help the middle class and rich. And if you hate the rich, you need to realize that policies hurting them will almost certainly hurt the less fortunate as well. One other lesson is that all income quintiles did particularly well during the 1980s and 1990s when free-market policies prevailed. P.S. Many people (including on the left) have pointed out that the Census Bureau’s numbers under-count compensation because fringe benefits such as healthcare are excluded. This is a very legitimate complaint, but it doesn’t change the fact that all income quintiles tend to rise and fall together. For what it’s worth, adding other forms of compensation would boost lower quintiles compared to higher quintiles. P.P.S. Here’s an interesting video from Pew Research showing how the middle class has become more prosperous over the past few decades. P.P.P.S. The Census Bureau’s report also has the latest data on poverty. 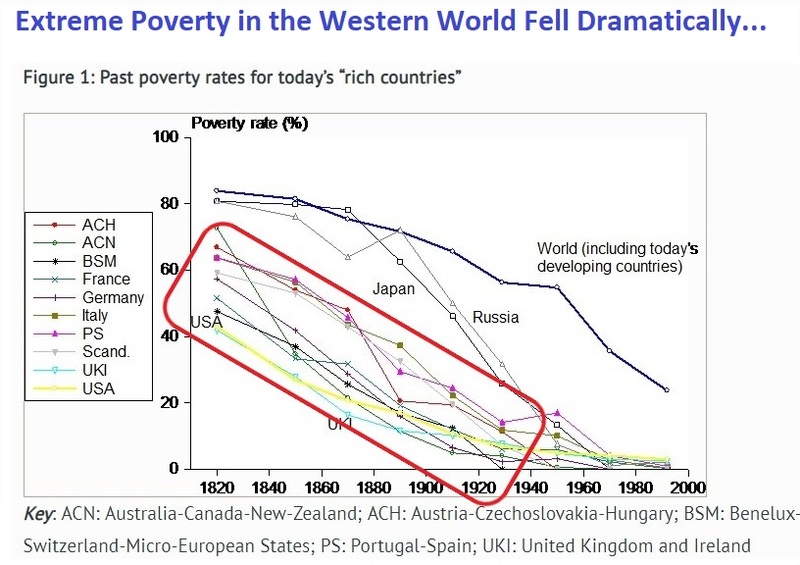 The good news is that the poverty rate fell. The bad news is that long-run progress ground to a halt once the federal government launched the ill-fated War on Poverty. When I argue against tax increases, I generally rely on two compelling points. Higher taxes will undermine prosperity by penalizing productive behavior. More money for politicians will trigger more spending, so red ink will increase. When I argue against centralization and urge Swiss-style federalism, I also rely on two very strong points. Local governments will be more responsible if they raise and spend their own funds. Competition among local jurisdictions will encourage better public policy. Now let’s mix these issues together by looking at some academic research on what happens when politicians get a windfall of revenue from a centralized source. Well, according to new research from Italy’s central bank, bigger government means more corruption. As far as I’m concerned, these results belong in the “least surprising” category. Of course you get more corruption when government gets bigger. Now let’s look at another study. A few years ago, academic scholars produced even more compelling research from Brazil. The paper studies the effect of additional government revenues on political corruption and on the quality of politicians, both with theory and data. The theory is based on a version of the career concerns model of political agency with endogenous entry of political candidates. The evidence refers to municipalities in Brazil, where federal transfers to municipal governments change exogenously according to given population thresholds. We exploit a regression discontinuity design to test the implications of the theory and identify the causal effect of larger federal transfers on political corruption and the observed features of political candidates at the municipal level. In accordance with the predictions of the theory, we find that larger transfers increase political corruption and reduce the quality of candidates for mayor. …The empirical findings accord well with the implications of the theory. Specifically, an (exogenous) increase in federal transfers by 10% raises the incidence of a broad measure of corruption by 12 percentage points (about 17% with respect to the average incidence), and the incidence of a more restrictive measure—including only severe violation episodes—by 10.1 percentage points (about 24%). By the way, this persuasive research isn’t just an argument for smaller government and fewer transfers. It’s also why foreign aid generally has harmful effects on recipient countries. Handouts line the pockets of the political elite and enable a bigger burden of government. It’s also one of the reasons why I’ve referred to the International Monetary Fund as a “dumpster fire.” That bureaucracy leverages its money (the U.S. is the biggest backer) to encourage higher tax burdens and more redistribution in countries that already are suffering from too much bad policy. The two studies we’ve reviewed today are simply an exclamation point. Last week, I shared a graph showing that there are more guns than people in the United States, and I wrote that it was the “most enjoyable” chart of the year, mostly because it gets my leftist friends so agitated. But I’m more likely to share gloomy visuals. The “most depressing” chart about Denmark, which shows a majority of the population lives off government. A “very depressing” chart about the United States, which shows how big business profits from cronyism. The “most depressing” chart about Japan, which shows that the tax burden has nearly doubled since 1965. Now it’s time to add to that list. There’s a website called “Our World in Data,” which is a great resource if you’re a policy wonk who likes numbers. But some numbers are quite depressing. For instance,if you peruse the “public spending” page, you’ll find a chart showing the dramatic expansion of redistribution spending as a share of economic output. 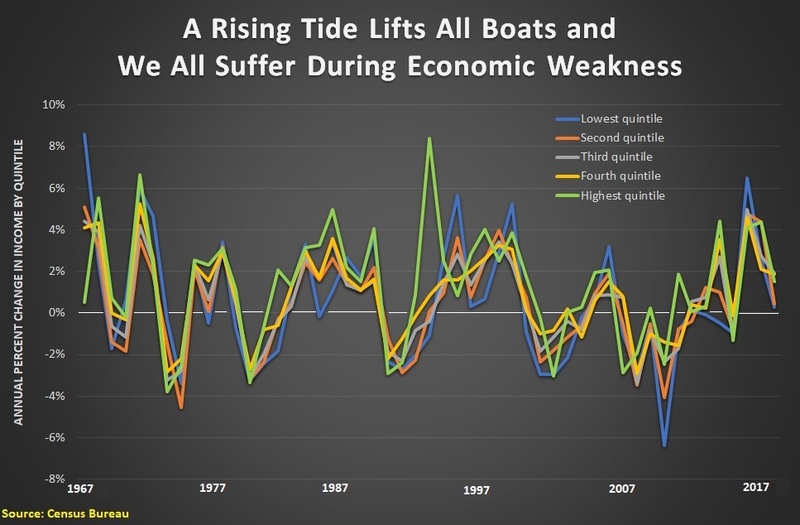 These numbers are very similar to the table I shared from Vito Tanzi back in 2013, which isn’t surprising since Professor Peter Lindert is the underlying source for both sets of data. 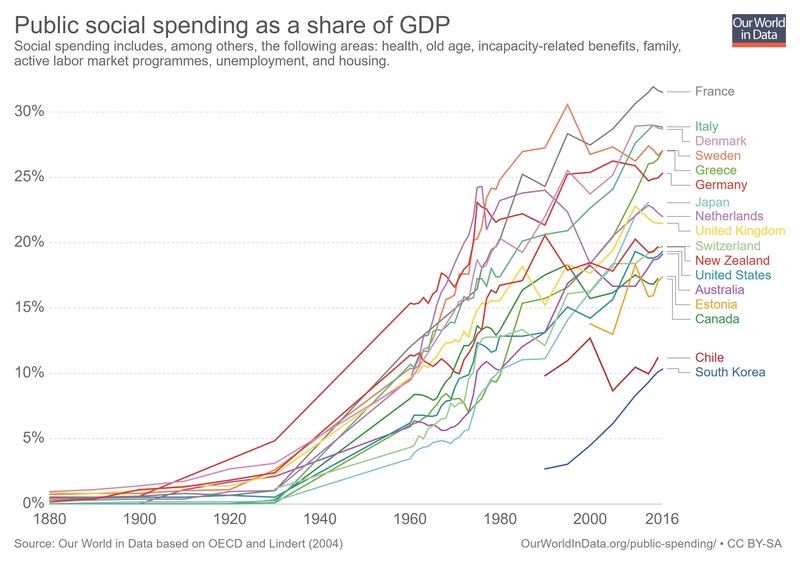 While the above chart is depressing to a libertarian, it’s nonetheless instructive because it confirms my argument that the western world became rich when government was very small and redistribution was tiny or even nonexistent. For instance, nations in North America and Western Europe largely made the transition from agricultural poverty to middle-class prosperity during the “golden century” between the Napoleanic wars and World War I. And that was a period when redistribution spending basically didn’t exist and most nations didn’t even have income taxes (the U.S. didn’t make that mistake until 1913). 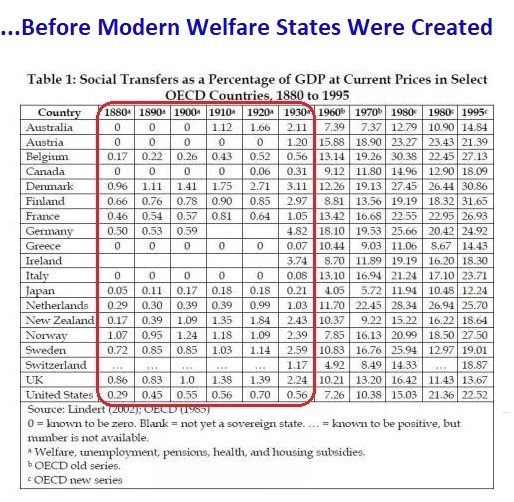 And even as recently as 1960, welfare states were very small compared to their current size. Indeed, redistribution spending in western nations averaged only about 10 percent of economic output, about half the size of today’s supposedly miserly American welfare state. These points are important because some folks on the left misinterpret Wagner’s Law and actually try to argue that bigger government is good for growth. P.S. South Korea has been a great success story for the past five decades, but that redistribution trendline is very worrisome. P.P.S. The trendline for Greece helps to explain why that nation is bankrupt. P.P.P.S. The chart shows that Canada is better than the United States, though that may not last since Canada’s current Prime Minister is seeking to undermine his nation’s competitive advantage. P.P.P.P.S. While fiscal trends in the western world have been unfavorable, that bad news has been offset by positive trends for trade liberalization. Whether we see a big step backwards because of Trump remains to be seen. I’m a big believer that some images do a great job of capturing an issue. The essential insight of supply-side economics. How the swamp beat Trump on the budget. The left’s view of how insurance should work. The one-way street toward liberty. The economic incentives of socialism. Speaking of socialism, let’s look at some more images that reveal the essence of that bankrupt ideology. 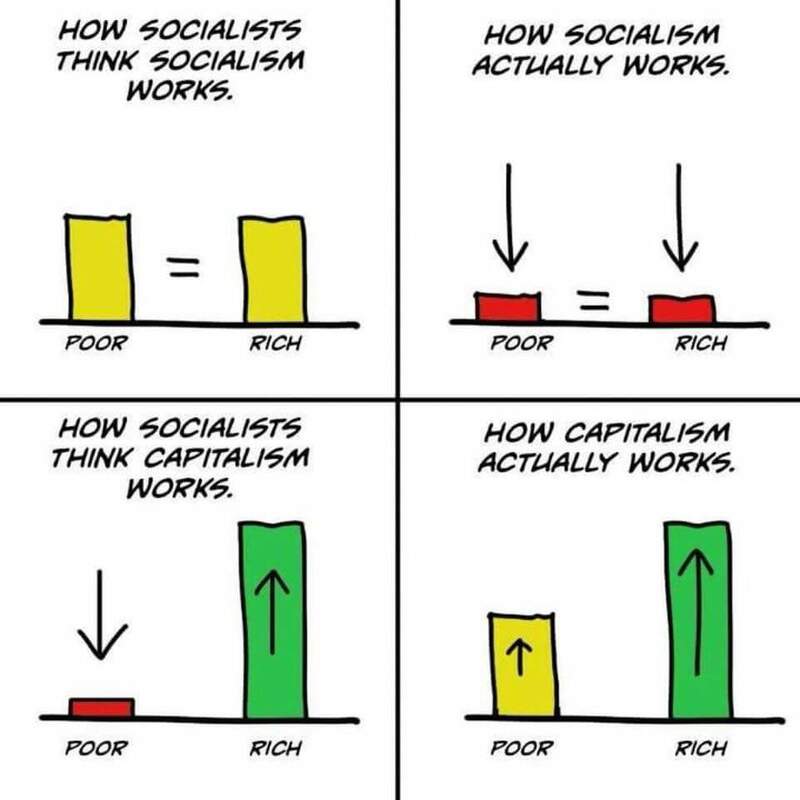 Here’s a cartoon from Libertarian Reddit that does a great job of showing the real difference between capitalism and socialism. Perfectly stated. Reminds me of the insights offered by Thatcher and Churchill. Sadly, if you provide the statists with real-world evidence, many of them still prefer the world in top-right frame rather than the bottom-right frame. 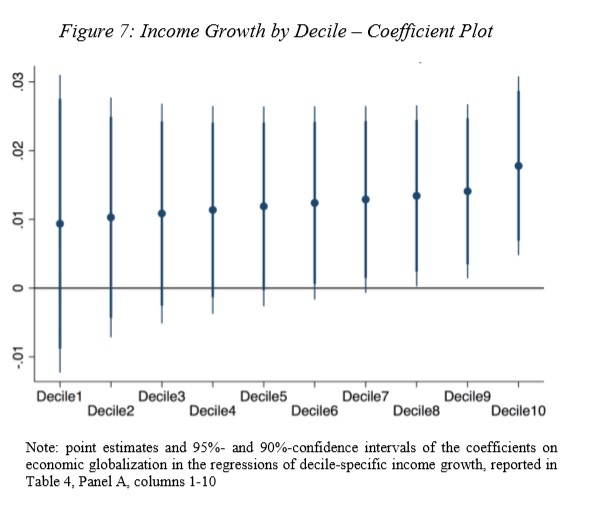 Heck, the IMF actually publishes studies supporting equal levels of poverty. 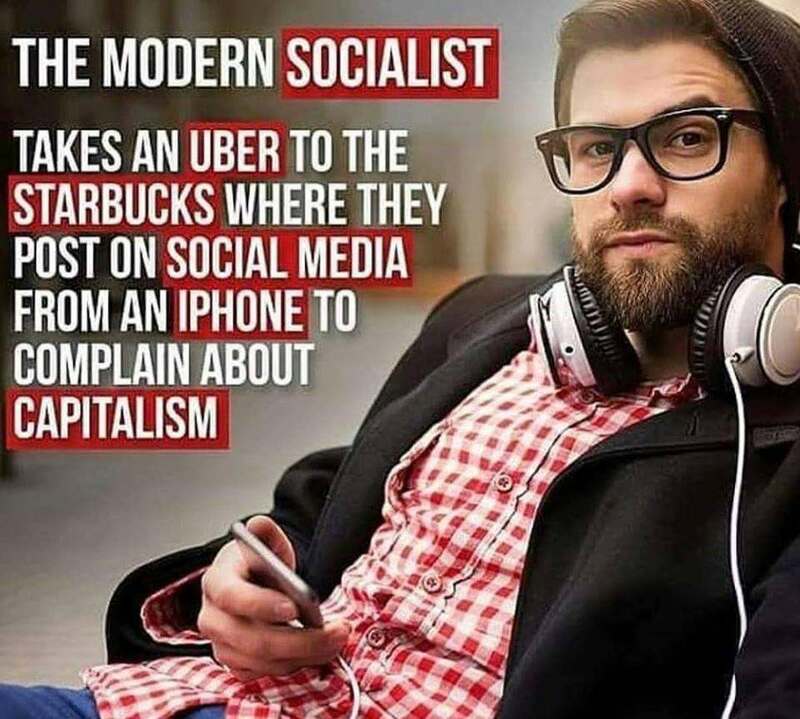 As you might suspect, there are plenty of socialists who enjoy the benefits of capitalism while urging statism for everyone else. Think, for instance, about all the leftists who use tax havens. Maybe he could have a ménage à trois with Pajama Boy and Julia? Though only if everyone is guaranteed equal levels of disappointment. 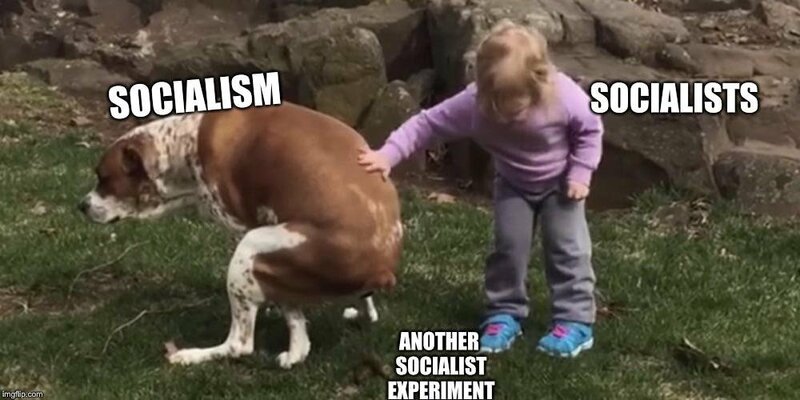 Next is a helpful reminder from Bernie Sanders about the very thin line between socialism and communism. Though I’m not sure there’s a meaningful difference. Last but not least, this gem from Libertarian Reddit appealed to my juvenile sense of humor. Basically the same message you find in the last item in this collection of socialism humor. P.S. Here’s my two-part series (here and here) on the bizarre allure of socialism. P.P.S. For additional examples of socialism humor, click here, here, here, here, and here. According to research from the Bank for International Settlements, the long-term fiscal outlook for the United Kingdom is very grim. 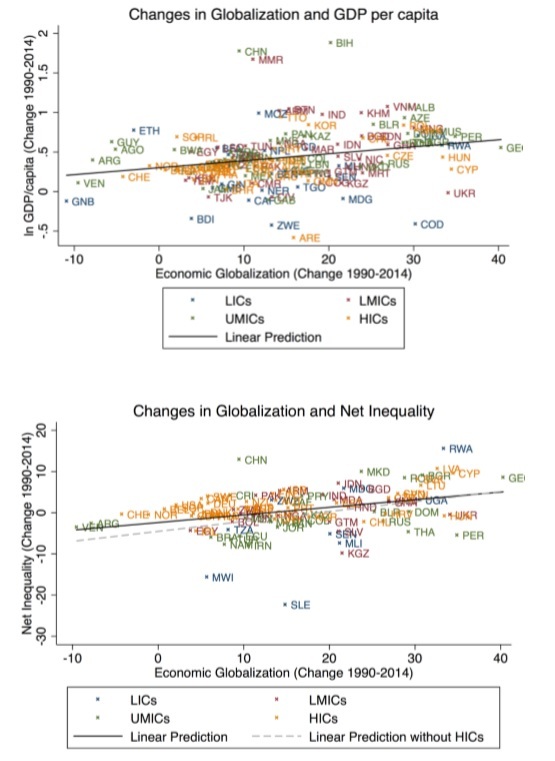 The data generated by the International Monetary Fund and the Organization for Economic Cooperation and Development isn’t quite as dour, but those bureaucracies also show very significant long-run fiscal challenges. The problem in the U.K. is the same as the problem in the United States. And France. And Germany. And Japan. 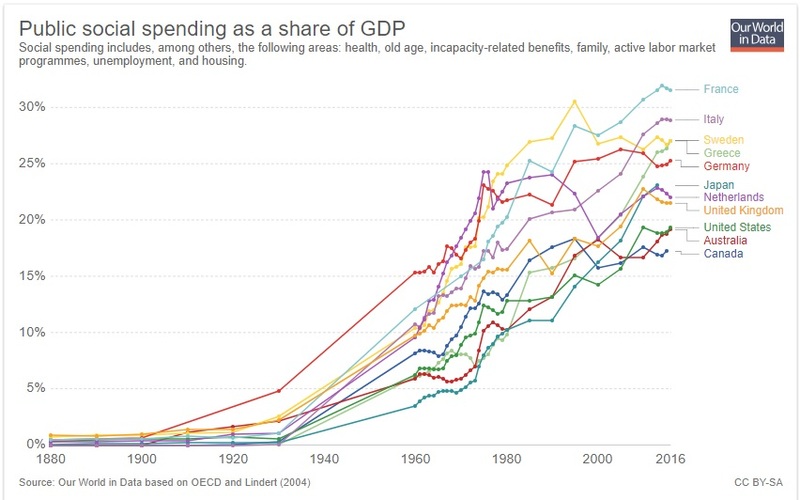 Simply stated, the welfare state is becoming an ever-larger burden in large part because the elderly population is expanding in developed nations compared to the number of potential taxpayers. The good news, as noted in this BBC story, is that some folks in the United Kingdom realize this is bad news for young people. Lord Willetts…said the contract between young and old had “broken down”. Without action, young people would become “increasingly angry”. The bad news is that these folks apparently think you solve the problem of young-to-old redistribution by adding a layer of old-to-young redistribution. A £10,000 payment should be given to the young and pensioners taxed more, a new report into inter-generational fairness in the UK suggests. The research and policy organisation, the Resolution Foundation, says these radical moves are needed to better fund the NHS and maintain social cohesion. …The foundation’s Intergenerational Commission report calls for an NHS “levy” of £2.3bn paid for by increased national insurance contributions by those over the age of 65. It says that all young people should receive a £10,000 windfall at the age of 25 to help pay for a deposit on a home, start a business or improve their education or skills. To be fair, proponents of this idea are correct about young people getting a bad deal from the current system. And they are right about older people getting more from government than they pay to government. “There’s no avoiding the pressures for more spending on healthcare and social care, the question is how we meet those pressures,” he replied. “Extra borrowing is unfair on the younger generation. “Extra taxes on the working population – when especially younger workers have not really seen any increase in their pay – will be very unfair. “It so happens that the older people who will benefit most from extra spending on health care have got some resources, so at low rates, it’s reasonable to expect them to contribute. But I fundamentally disagree with their conclusion that bigger government is the answer. 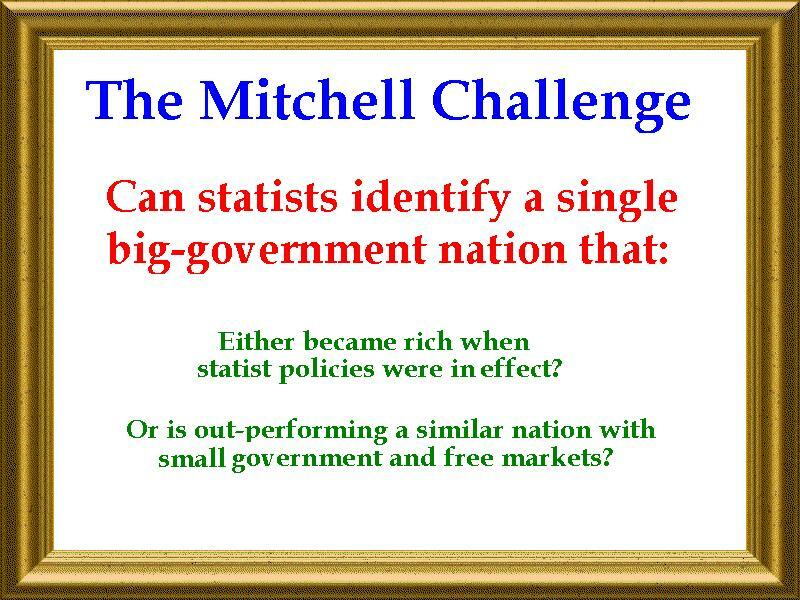 For what it’s worth, what’s happening in the U.K. is an example of Mitchell’s Law. Young people are getting a bad deal because of programs created by government. But rather than proposing to unwind the programs that caused the problem, the folks at the Resolution Foundation have decided that creating additional programs financed by additional taxes is the way to go. By the way, you won’t be surprised to learn that the group also has other bad ideas. The report calls for the scrapping of the council tax system, replacing it with a new property tax which would raise more money from wealthier homeowners. The proceeds would be used to halve stamp duty for first-time buyers. Let’s close by looking at some interesting data about the attitudes of the young. …a poll undertaken for the Intergenerational Commission also suggested people were more pessimistic in Britain about the chances of the next generation having “better lives” than the one before it – compared with almost any other country. Here’s the chart showing data for the U.K. and several other nations. 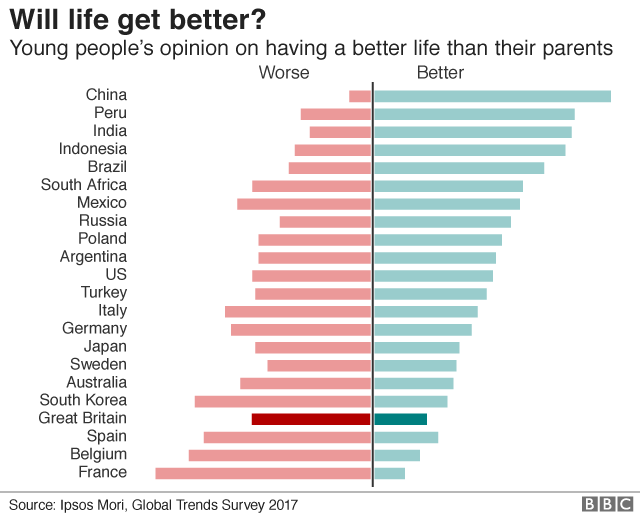 Congratulations to France for having the most pessimistic young people (maybe this is why so many of them would move to the U.S. if they had the chance). And I think the South Koreans are too glum and the Chinese are too optimistic. The Italians also are too upbeat. But otherwise these numbers generally make sense. P.S. I was very pessimistic about the U.K. in 2012, but had a more upbeat assessment last summer. Now the pendulum has now swung back in the other direction. P.P.S. If the Brits screw up Brexit, I’ll be even more downbeat about the nation’s outlook.